Right angle weave (“RAW”) is one of the most versatile beading stitches around! You can dress it up or down, use all kinds of bead sizes and make jewelry that stands out from the crowd! Right angle weave is named because the beads in a unit sit at right angles to each other. The units can be as small as four beads, or as many as you wish (although the number is typically divisible by 4). Topical Seas: A bracelet in shades of seafoam and aqua, glistening with pearls. Some Swarovski crystals adds sparkle and shine. Diamonds for Angel: One of the challenges of right angle weave is that thread often shows. Another is that units made with large beads can be unstable. Not with this bracelet — you’ll discover how to stabilize them…and also hide your thread at the same time! 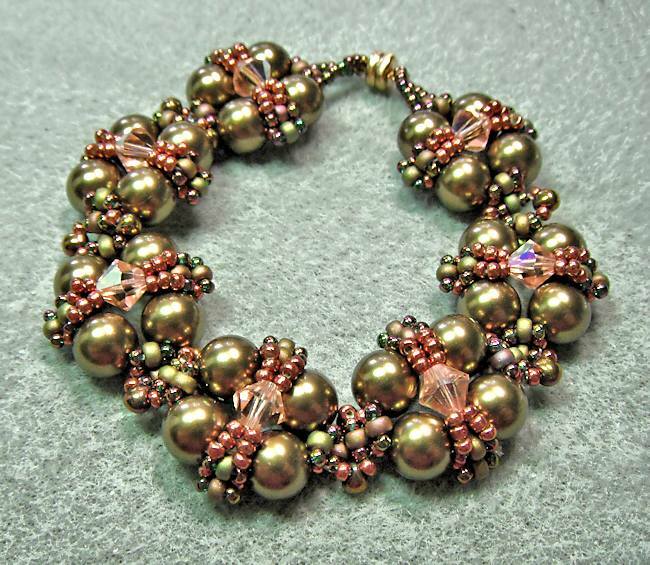 Renaissance Flair: Large round beads are especially difficult to stabilize, but this bracelet proves that it can be done…and done with flair! Triangulation: When’s a tube not a tube…when it’s a triangle! Tubular RAW takes a different shape with three sides. All by itself it’s kinds cool, but add some embellishments that emphasize the triangular shape and has an absolutely wonderful feel to it. While this tutorial assumes you have been exposed to right angle weave, in the appendix there are step-by-step instructions and photos on how to do RAW. And speaking of in structions and photos — there are 45 pages and 98 photos! The photos are close up, so you can see exactly what you are supposed to do. Note: This book is in PDF form, and is only available by downloading. However, you get this ebook immediately after purchasing — you will see a link on your invoice, and you’ll also get an email with the same link. The file is about 2 MB in size. To get this ebook digitally delivered (i.e., you get it immediately), simply click the “Add to Cart” button. It’s just $10. 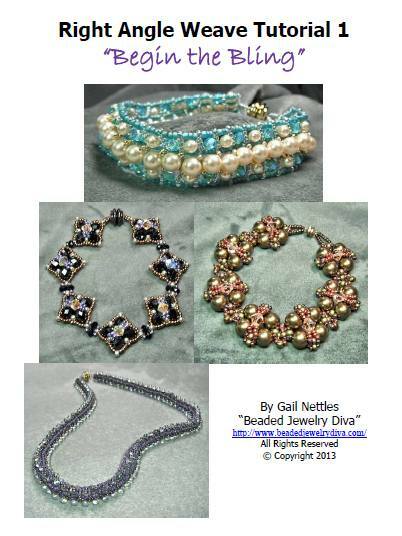 I do my best to over-deliver, so I think you’ll be pleased — not to mention on your way to creating some gorgeous right angle weave jewelry!